NEW ORLEANS— It was a historic week for Division I women, with two national records and incredibly fast sprinting. New CR holder Demi Payne is joined by six other individuals and a relay as the National Athletes of the Week. The U.S. Track & Field and Cross Country Coaches Association (USTFCCCA) announced the selections on Tuesday. The eight winners–alternating genders and going DI-DII-DIII-NJCAA–are John Teeters of Oklahoma State; Demi Payne of Stephen F. Austin; Justin Welch of Findlay; Lindsey Butterworth of Simon Fraser; Luke Winder of North Central; Adriana Wright of Lehman; Stephan James of ASA College; and the South Plains women’s 4×400: Diamond Gause, Domonique Williams, Medinah Spencer, and Brandi Dobbin. Scions of successful vault families (Payne and Winder), transfers (Teeters, Payne, Welch) and foreigners (Butterworth, Wright, James, Williams) ruled the roost this week. Click each of the student-athletes’ names above or keep scrolling below to read about the exploits that made all eight worthy. 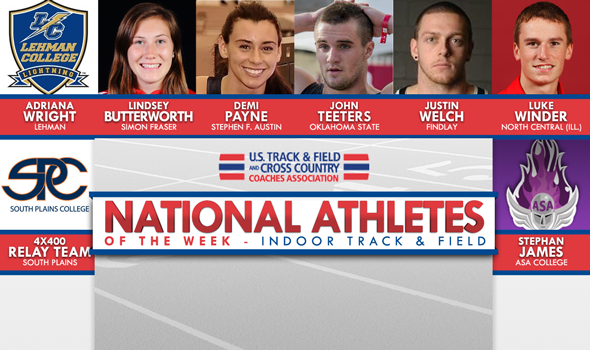 National Athlete of the Week is an award selected and presented by the USTFCCCA Communications Staff at the beginning of each week to eight (male and female for each of the three NCAA divisions, plus the NJCAA) collegiate track & field athletes. On the same weekend that Trayvon Bromell made his season debut and a week after Jalen Miller ran a world-leading 6.56 for 60 meters, a somewhat surprising name sits atop the descending order list: Teeters. The junior and Oklahoman ran 9.91 in the 100 at the famously gusty 2014 Big 12 Championship, but that’s no longer his signature race. Teeters blew away his heat by a ridiculous half a second (that’s roughly equivalent running a 4:00 mile with second place running 4:19) to break the OSU school record and get the win on Friday night at the University of Nebraska’s Holiday Inn Invitational. Winning the DI women’s NAOW was tough sledding this week: Sandi Morris of Arkansas broke the collegiate record in the vault on Friday night, and Jasmine Todd of Oregon ran the fastest 60 meters by a collegian ever in the month of January. But neither could beat out Payne, who is the first college woman to ever clear 4.63m (15-2.25) indoors or outdoors. She did so on Saturday at Texas A&M’s Team Invitational. This season is Payne’s debut for Stephen F. Austin; she competed for Kansas from 2011-13 before taking off last year to have a child. On Saturday, she passed until every other vaulter at the meet was eliminated, entering at 4.30 meters. She cleared 4.30 and 4.45 on her first attempt at each, and on just her third jump of the day, cleared 4.63 for highest vault in NCAA history, any conditions. With the bar raised to 4.65, she missed all three attempts. Payne’s father Bill competed at the 1995 world championship in the vault; he told a local newspaper on Saturday that "We had [Demi] up on the runway a week after she had her baby." Men’s weight throwers have had this award on lock so far in this young season–last week’s winner, Zac Ball, beat Welch by two centimeters to win the event at the GLIAC meet last winter. Welch got his revenge at the NCAA championship a few weeks later, winning a national title in the weight. He’s on track to repeat in 2015; his 22.15m (72-8) throw on Saturday is the farthest in Division II this year. That’s twelve centimeters shy of Welch’s PB. It was good enough to win the Northwest Ohio Invite in his home cage, where he beat out 2013 Division III hammer champ Tom Postema for the victory. For a breakout performance at Washington’s UW Preview, Butterworth is the first athlete from a Canadian college to win National Athlete of the Week. She covered a full mile on the oversized Dempsey track in 4:44.80, finishing sixth overall and as the second collegian. Finishing ahead of her were some of the best middle distance runners in the country: Shannon Rowbury, Jordan Hasay, Treniere Mosier, Jess Tonn, and Phoebe Wright. That makes her the second fastest performer in GNAC history, behind only Jessica Pixler. Butterworth has mostly focussed on the 800 in the past, as she was fourth in the outdoor 800 final in 2014. With the quality of this time, though–it’s the fastest in Division II this year by ten seconds and the fastest regular-season DII time since 2011–the mile and 1500 may be in her future. Making his college debut, Winder entered at 4.95m, cleared that on his first attempt, and on just his second jump of the day, cleared 5.10m (16-8.75) for the early-season national leader. It’s likely to stay pretty high on the list: 5.10 would have been the second highest indoor or outdoor vault in all of DIII last season. The mark was good for second place at Grand Valley State’s Mike Lints Alumni Open. Luke’s brothers Josh and Jake were pole vault national champions for North Central, and their father Tim has been the vault coach at NCC for 22 years. Competing against most Division I and juco competition at the Armory’s NYC Gotham Cup, Wright served notice to the rest of Division III that she could be the nation’s toughest dual threat in the sprints and hurdles. She ran nation-leading times of 7.66 in the flat 60 meters and 8.60 in the 60 hurdles. That 60H time is the fifth fastest in DIII indoor history. With Mallory Burnham of St. Thomas graduated–she won the outdoor 100 hurdles and took second in the flat 100–Wright could replace her on the national scene. The sophomore from the college in the West Bronx took eighth in the 60 meter final on Friday night and second in the hurdles, running her faster hurdle time in the prelims. James ran a blazing 21.26 for 200 meters–one circuit of the Armory’s banked track–and finished second overall (first collegian) at the NYC Gotham Cup on Friday. That’s the fastest time in the NJCAA this winter, and James is poised to take over the junior college sprint scene. The Guyanan is the top returner from outdoor nationals in both the 200 and 400. He also ran a leg of ASA’s second overall/first college team 4×400 relay on Friday. Most of this quartet is utterly familiar with national recognition. Gause, Williams, and Dobbin all ran on one or both of South Plains’s national-championship-winning 4×100 and 4×400 relays outdoors (Dobbin only ran in the prelims) in 2014. On Saturday, those three plus Spencer teamed up to run 3:42.41 in the 4×400, finishing second only to hosts Texas Tech (currently the ninth fastest team in Division I) at the Texas Tech Indoor Open. Even with the slight altitude penalty for competing in Lubbock, that time is the fastest in the NJCAA this winter by more than five seconds.